February 14 rolls around and we are quick to think of red roses and romance but there are many different kinds of love, love that is different, stronger than and just as important as couple love. Valentine's Day is about more than buying cards and flowers and going out to dinner. It's also a good time to express the love you have for your children and to encourage your children to show the love they have for you. When you have kids you're always in love. The magic moments are just waiting to happen. All you need to do is grab the opportunities and here is a BIG one! Do you remember the little heart shaped candies with messages on them? Pale and fun color hearts with red colored messages? I know! Well, why not have a little fun with your kids where you create your own messages to send to some of your favourite people? There are endless possibilities to making allergen friendly treats so everyone can be included. I have a drawer full of cards and drawings and handwritten messages from the kids given to me over the years. They're sacred to me. Knowing how precious little love notes can be -- a word, a phrase, a sentiment -- hey, let's make edible Valentine's messages. You will want to eat your treats so have fun and don't forget to take photos of your goodies so you can still save those special memories, or better yet, take photos of you eating them, making them, or a video message incorporating them. Parents and children getting love messages, spending time together doing a project and indulging in tasty treats? Now we are talking Multiple Magical Moments! I can pretty much predict my message from my son Jake will be on a mint brownie (that's his favourite treat) But you can choose Rice Krispies treats, cookies, cakes, fondant cut-outs, pop-tarts, pancakes or any other treat you like as the surface to write your message or go the other route and choose something savoury instead. How about crepes or omelettes? Be creative, think out of the box, be unique, be YOU. What shape to use? Well, for Valentine's Day I definitely think a heart is the way to go but you can also surprise your kids with a messaged treat in their lunch box on any day of the week, not just for Valentine's! Try topping their GF sandwich with a happy face drawn in mustard and see what kind of rise you get out of them. But I digress. What kind of messages? The ones that come from the heart, the ones that make you laugh and the ones that show your personality! If you can't stand the pressure, Google your favourite words online. And when all else fails, the obvious "XO" "LOVE U" and BE MINE" can save the day! The message is literally the icing on the cake! 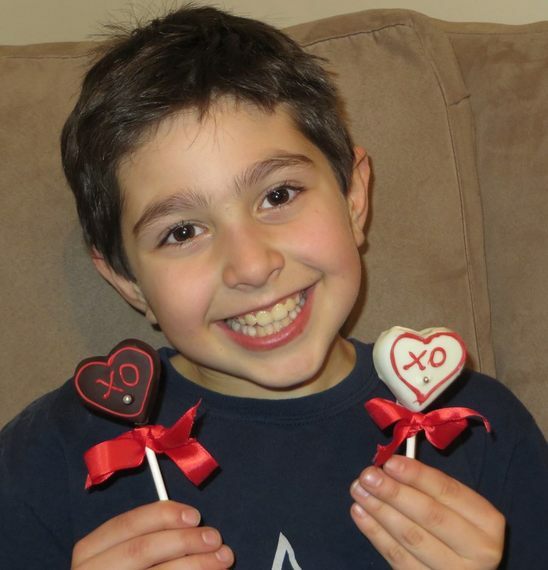 This Valentines day, spend time with your kids making treats you love to eat and write a message on it! For anyone who is restricted to any kind of foods, there's always something that you can have fun with, that doesn't contain your allergen or that of your friend's. Make a list of all the people you want to share it with and off you go. And if you live far way from a loved one, make it, take a photo or video and share it. We all know how easy it is to get swept away by our work, the kids' activities and the constant barrage of appointments and obligations. Sometimes we have to make a decided effort to schedule in some magic-making with the people we love. This Valentine's Day, consider a project with the kids that will be etched in their memories (and yours too! ), a loving message written into a treat that will be eaten but etched in your heart forever. That's worth something! In this crazy mixed up world, this is where the magic is; in the simple things that warm the heart and say "I love you."